I once received a little terrarium as a \”secret Santa\” gift when I was in college. It was between the girls\’ side of the floor and the boys\’ side in my dorm that year. It was a nice gift, I thought. I don\’t know what happened to it. I\’ll stand by for your nod of approval when the furniture comes through the front door. Maybe your can post it on Facebook? I love that unusual and fanciful \”little girl dresser.\” So, do you still own it? Was this to use as a girl? My discovery this week? My dog sticks with me throughout the house (has to know where I am) because, canines being \”pack animals,\” she thinks I\’m a dog like her and that we have to stick together. Random I know, but it helps me understand why she gets up from her little comfy bed and moves to another part of the house, settles, and then gets up again as I move back to the bedroom or study. 🙂 And I\’d rather she just stay put. You asked for it! 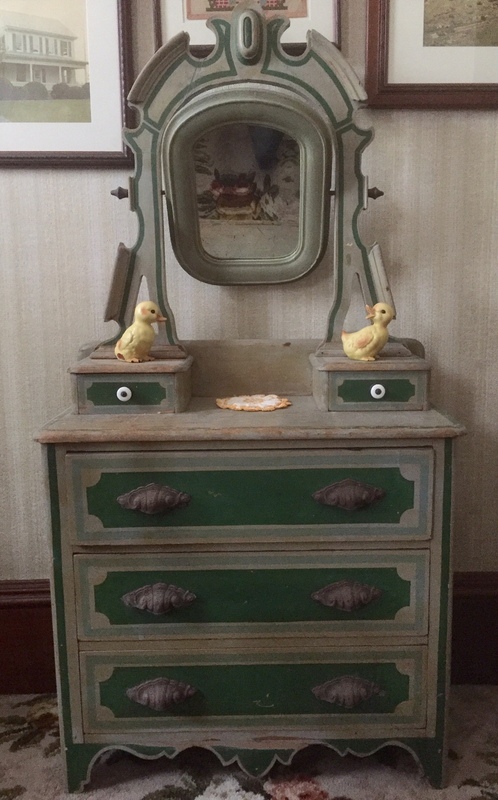 The little dresser (about 3-feet high from floor to surface, not including mirror) is in my Aunt Ruthie\’s house. I\’m certain she played with it as a child, and so did we. It\’s still officially hers, not mine. I\’ve noted to get some bubbles and take them to school for my 2 little pupils who I assist in reading … perhaps before we begin each class we can blow bubbles and have a little science class thrown in. Bubbles are magic – thank you for your unplanned prompt to me! I\’m so thrilled that you adapt what you find here in your unique way. I love to think of bubbles blowing in the breeze in Johannesburg inspiring your students. And unlike bubbles, this verse of scripture is not ephemeral, but a divine promise. I understand your regret about the dresser. Aunt Ruthie gave me a very nice watch which I didn\’t take care of – it probably got lost during my teenage years; I feel a sad twinge every time I think of it. So you have a terrarium in Spain? I\’m guessing you had one when you lived in Canada too, something green nurturing you during the long days of winter. There\’s something magical about a scene captured under glass. Even if it is plastic. Little Owen received a gift of sea creatures to make little domed seascapes with water and seaweed. He and two friends each chose their scenes, filled the domes with water, and \”voila!\” brought the ocean (and their memories of being at the beach) into their bedrooms. Each generation finds ways to light up the imagination and preserve one season into another. It\’s hard to keep up with you my peripatetic, philosopher friend. I think you have been filled with wonder surrounded by grandchildren recently as little Owen turned five. I agree, scenes under glass are magical. Sarah made a snow globe capturing the images of Curtis and Ian, forever young in 2011. I smile when I hear Curtis speak with his deep bass voice and see a prominent \”mustache\” coming on. That\’s not a bad idea at all! I\’ve seen lots of motorhomers carrying theirown plants, and we did too one year, but the heat in France didn\’t agree with our British geraniums and the leaves dried up very quickly. What a beautiful dresser, Marian. I love the little chicks. On Monday, I was blessed to spot our first hummingbird of the season. Unfortunately he didn\’t stick around since we haven\’t put out the feeders. I love them! When you put out the feeders, magic will happen, I suspect, Jill. Once we had a hummingbird come to our porch, but after awhile the bird didn\’t return. Now I don\’t know what happened to the feeder. Hummingbirds are so dainty and beautiful, symbolic of joy to me. I don\’t know how long the little chicks have been sitting on that dresser. Aunt Ruthie probably put them there years and years ago. I\’m glad you noticed them, a little pop of spring. Ah, that\’s the problem. I didn\’t pay enough attention to the nectar. No wonder the hummingbird frowned at the concoction gone sour and never returned. You\’re so smart, Jill. Thank you! I remember learning how to blow bubbles with Bazooka bubble gum. The hardest part was chewing, and chewing, and chewing to get those hard little powder-covered pink blocks to soften up—I\’m surprised they didn\’t yank me teeth out! I guess if I had to declare a brand, it would have to be nostalgia. I\’m glad you enjoy my trips back in time. Marian, I love these sojourns into the past, complete with photos. 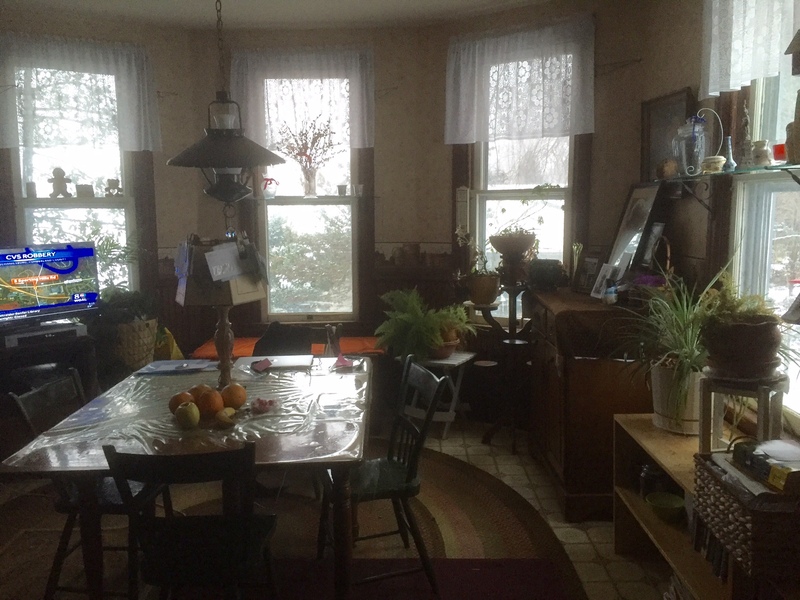 The picture of your grandma\’s dining room with those gorgeous windows and plants took me back to my own grandma\’s dining room. And I love the child\’s dresser and dome, all preserved so beautifully. My discovery this week and only because I decided to declutter my office.. I found a cherished photo of my son as a 10 year old, hanging out in a maple tree with his baseball hat askew. I\’d been looking for it to no avail. I felt like I found a treasure! I made another discovery today too. As I was looking for my \”retirement\” scrapbook in my cluttered office, I found a whole bunch of school stuff (textbooks, lesson plans and folders) that I could dispose of. Some will go to Angel Aid Charity and some into the recycling bin. Eventually, I found what I was looking for, but only after I lightened the load on my bookshelves. Ah, the \”un-bearable lightness of being\”! I\’m guessing you may frame the photo you found and give it to your son one day. Thank you for sharing the anecdote of an important discovery, Kathy. I agree – some sort of alchemy happens as we age, and siblings get more or less alike in values and tastes. That\’s true of my own sister Janice (Jan). You have such an interesting writing style. I know I\’ll always smile when I read your comments. Thanks, Cherry! My Christmas cactus didn\’t re-bloom this year. Maybe 1-2 flowers are all that materialized a few months ago. When I re-potted it, I think I added too much soil and too high in the pot, maybe choking the poor thing. I\’m glad you are blessed with blooms in more than one season. So cheery! Thanks, Athanasia. Lovely post, Marian! Obviously lots of sweet memories for you. The plant picture made me think of my orchid. I got it for my birthday last year, when it was in full bloom. It continued blooming for months. After it stopped I decided I wanted to try to get it to bloom again. I bought a book on orchid care and gave it my best shot. My orchid must have loved what I was doing; it now has, not one, but two new shoots. Two sprays of flowers soon!! I can\’t wait! Welcome, Linda, so happy to see your sun-flower image here along with an up-lifting comment. I\’m so pleased pleased that your orchid has re-bloomed. I have never had much luck with orchids re-blooming even though my daughter taught me where to trip the stem for re-growth. However, lately two of my orchids, one white and another red-violet have decided to bloom again. Like you soon, I\’m enjoying two new sprays of flowers. Thank you, also, for following my blog today. I\’m glad we have this connection. 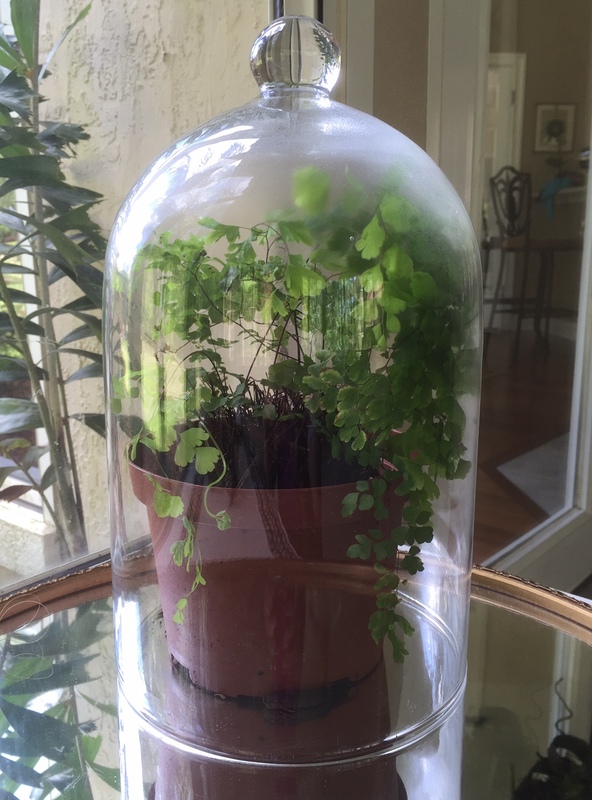 I\’ve got over 50 houseplants but never thought of having a terrarium like the ones you depicted. Now I want one, so thanks for expanding my horticultural horizons! I\’m glad this post inspired growth in another direction. 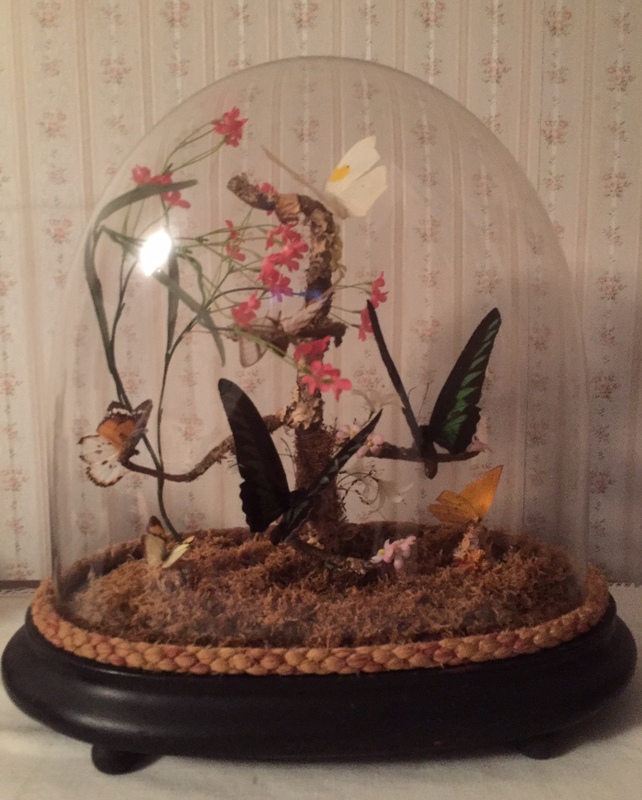 I never had a terrarium, but Grandma did and so does my daughter. I look forward to seeing what you (and Sage?) create. I do see a blog post about this project down the line. Ha! I just re-read your posting – 50 houseplants. That\’s a lot of watering and tending – and a lot of oxygen in your house, a very good thing! Marian, thank you for sharing more beautiful images and memories. I\’ll always think of Aunt Ruthie on her riding lawnmower. 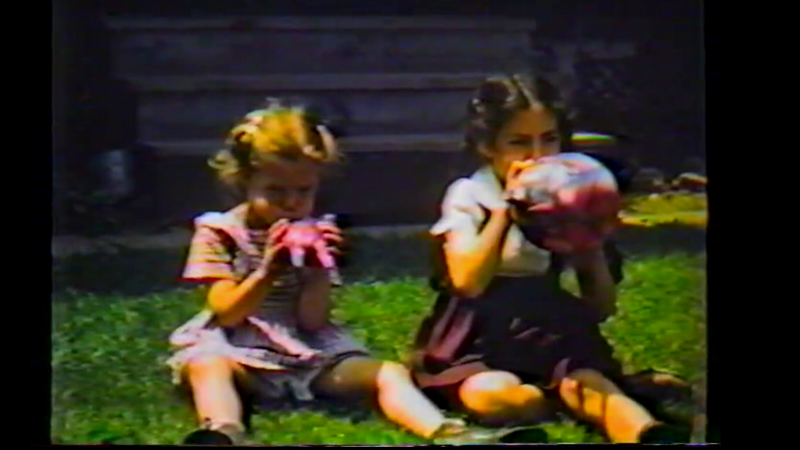 Bubble and balloon blowing are nearly a universal part of childhood (at least in this country) for a few generations back. The Corinthian verse becomes ever more meaningful as I grow older–like many things. I discovered just how tough crocus and daffodils are when packed away in a little snow. It\’s not unusual for the temperature to dip into low 30s here in April, but it was 17 degrees a few nights ago after four or five inches of snow. Our maddening April snow melted today and most of the flowers are undamaged. I\’m going outside to discover the fate of the buds on the magnolias and other blossoming trees and shrubs. Ah, the persistence of nature. Spring flowers are tough. I guess I\’ll check your Facebook pages to see the magnolia buds. Hardy varieties will make it through unscathed, my hope for you. This week I\’ve seen varied images of you: face set like a flint on the tractor, pumping iron on workout equipment, and then ministering healing on your blog. The many faces of Eve is no myth in your case. Thanks for being you, Elaine! I\’m glad you enjoyed this photo from long ago, as I enjoyed your pictures of the Rhine this morning. You give new meaning to a cloud-y day, Fiona! As for discoveries . . . I\’ve finally got to the bottom of my husband\’s mysterious illness. I\’ll be posting next week. 🙂 Wishing you a happy weekend. You have persisted, dear woman. You didn\’t seem at all absent from the cyber world in spite of our husband\’s \”mysterious illness.\” But, like me, your online connections often relieve stress, knowing friends there have a sympathetic ear. I love these rambles through memories, the things that knit us with our past experiences and the souls who peopled our lives. They\’re so rich with personal history. Even though the memories are different, I can\’t help being pulled into the nostalgia. Lovely post, Marian. My Grandma & Aunt Ruthie\’s house is one of the anchor points in my memoir. If I have a brand at this stage, I\’d name it nostalgia. I\’m glad you can relate to the sensation – and so happy we made a connection here. Blowing bubbles is one of my strong memories from early childhood. I\’d stand at the top of the back steps and watch them drift off across the gardens. You can\’t beat bubbles. No, you can\’t beat bubbles. 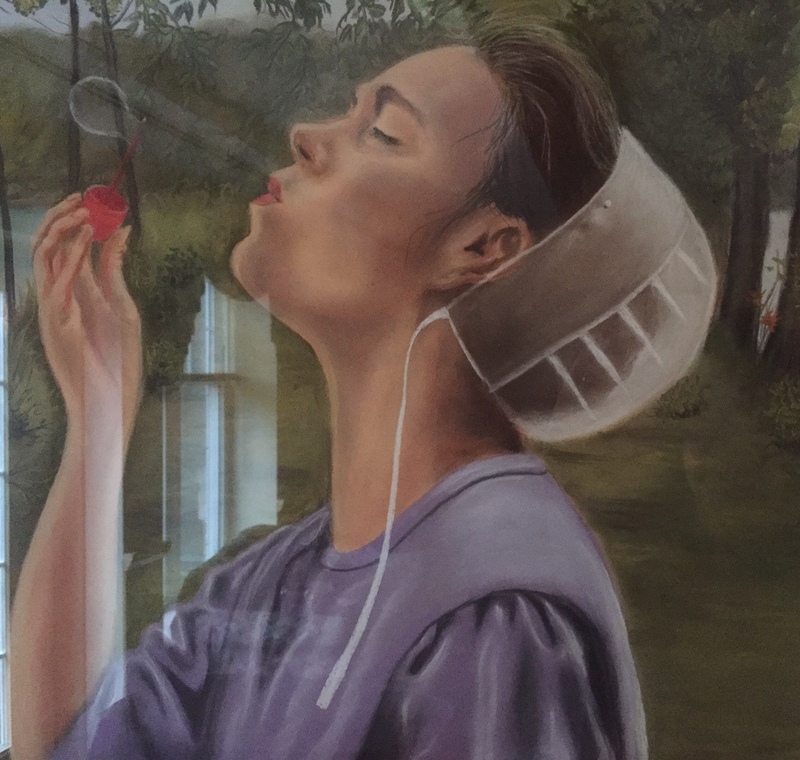 Now bubbles have become symbols of the imagination we put into our blog posts. At least I like to think so. Sweet memory!